John HAIGH was born 23 May 1798? or 1795/6 in Penistone, Ingbirchworth or Hepworth and was christened 24 Jun 1798? in Penistone. He died on 18 Jan 1873 and was buried in Penistone Church. John married Frances WOOD on 23 Jun 1822 in Penistone. 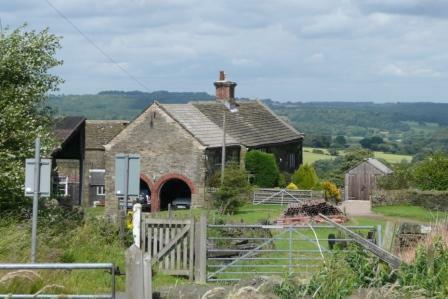 Frances was born in 1798/1801 in Penistone or Thurlstone. She died on 1 Jul 1880 and was buried in Penistone Church. Charles HAIGH was born Abt 1829 or 1826. 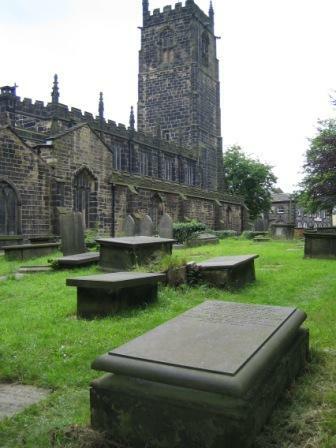 He died on 2 Jul 1848 and was buried in Penistone Church. His parents were subsequently buried with him. Mary Ann HAIGH was born about 1829-1831. She married George JACKSON (b abt 1821 in Ingbirchworth) in the 3rd quarter of 1850. They had 6 children all born in or around Ingbirchworth. The children were John Haigh JACKSON (b 3q 1851), Frances Hannah JACKSON (b 2q 1854), Charles Edward JACKSON (b 4q 1856), Oliver JACKSON (b 3q 1860), Joel JACKSON (b 2q 1863) and George JACKSON (b 4q 1869). In 2q 1875 daughter Frances Hannah married Thomas POOLE and they had 3 children Wilfred (b abt 1874), Marsden (b abt 1877) and Mary Ann (b abt 1880). Elizabeth HAIGH was born on 11 May 1831 in Carhead and was christened on 23 Jun 1831 in Penistone. Frances HAIGH was born on 6 Apr 1834 in CarrHead and was christened on 18 Sep 1834 in Penistone. Frances married George HELLIWELL. in 2q 1856. They had 3 children: Sarah Ann (b 1857), William (b 1857) and Fred (b 1859). After being widowed, Frances married John Langley KNOWLES in 3q 1861. They subsequently had 6 children: John L (b abt 1863), Sarah L (b abt 1865), Elizabeth L (b abt 1867), Franny L (b abt 1869), Mary (b abt 1873) and Martha (b abt 1877). 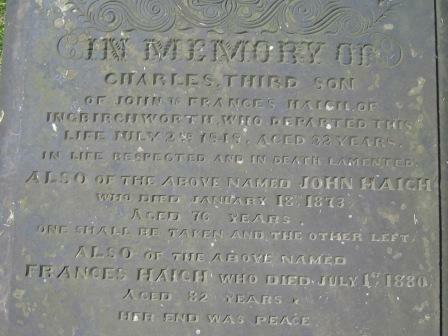 John HAIGH was born on 20 Sep 1836 in Carrhead and was christened on 15 Dec 1836 in Parish Church of Penistone. John married Sarah Hannah CROOKES, daughter of Thomas CROOK(E)S and Mary Ann DARWENT (DARWIN), on 16 Apr 1865 in Denby. Sarah was born on 20 Nov 1844 in Ingbirchworth and was christened on 4 Sep 1845 in Parish Church of Penistone. James HAIGH was christened on 12 Mar 1840 in Penistone. The parents of John HAIGH were possibly: George HAIGH, who was christened on 29 May 1763 in Wortley, Yks., and Mary BRADLEY, who was christened on 3 May 1770 in Penistone. George and Mary married on 29 Jul 1793 in Penistone.